The SG ProgramPad series, known as the Imagineer ProPad MD (イマジニアプロパドMD) in Japan, is a set of third-party control pads for the Sega Mega Drive, manufactured by Recoton's STD Manufacturing division (later under the QJ and InterAct brands). It is a more advanced alternative to the SG ProPad, and came in two forms - the three button SG ProgramPad and a six button variant known as the SG ProgramPad 2 in Europe and SG ProgramPad 6 in North America. The SG ProgramPad, as the name suggests, has a built-in LCD display and the ability to "program" button combinations. This is especially useful in fighting games (for example in Street Fighter II: Special Champion Edition, will make Ryu perform his trademark hadouken move, and by mapping this sequence to a button, this gives the player an advantage over the competition). The original SG ProgramPad is a effectively a three button controller (though obviously contains other buttons for which to map control combinations to). The ProgramPad 2/6 is largely the same, but has an extra button and 66 common moves already built into the ontroller, with a further six slots available for custom combinations. 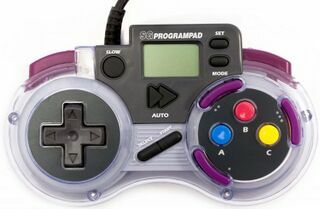 SG ProgramPad is an awkwardly designed controller, as presumably Recoton wished to recycle designs for their "SN ProgramPad" range for the Super Nintendo (a similar story occurred with the SG ProPad).